Metro-Goldwyn-Mayer Inc., through its operating subsidiaries, is actively engaged in the worldwide production and distribution of motion pictures, television programming, home video, interactive media, music and licensed merchandise. The company owns the world’s largest library of modern films, comprising around 4,100 titles. Operating units include Metro-Goldwyn-Mayer Studios Inc., Metro-Goldwyn-Mayer Pictures Inc., United Artists Films Inc., Ventanazul, MGM Television Entertainment Inc., MGM Networks Inc., MGM Domestic Networks LLC, MGM Distribution Co, MGM International Television Distribution In, Metro-Goldwyn-Mayer Home Entertainment LLC, MGM ON STAGE, MGM Music, MGM Worldwide Digital Media, MGM Consumer Products and MGM Interactive. In addition, MGM has ownership interests in international TV channels reaching nearly 120 countries. MGM ownership is as follows: Providence Equity Partners (29%), TPG (21%), Sony Corporation of America (20%), Comcast (20%), DLJ Merchant Banking Partners (7%) and Quadrangle Group (3%). For more information, visit www.mgm.com. 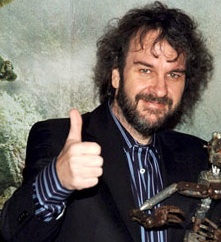 Peter Jackson is one of the world’s most successful filmmakers. His monumental achievement co-writing, co-producing and directing The Lord of the Rings trilogy (with fellow Academy Award winners and frequent collaborators Fran Walsh and Philippa Boyens) earned a total of 30 Academy Award nominations and 17 Academy Awards. Jackson and Walsh received their first Oscar nomination for Best Original Screenplay for their acclaimed film Heavenly Creatures. Jackson, through his New Zealand-based Wingnut Films banner, also was responsible for the globally successful 2005 remake of King Kong which earned over $500 million worldwide and 3 Academy Awards. Currently, Jackson is directing an adaptation of The Lovely Bones, from the acclaimed best-selling novel by Alice Sebold. He is also developing a trilogy of films with Steven Spielberg based on Tintin, the world renowned comic book series by Herge.